Box Hill remain at the top of the table, after they finished over the top of a gallant Melbourne in the Round 14 Direct Connect #DewarShield Match of the Round. 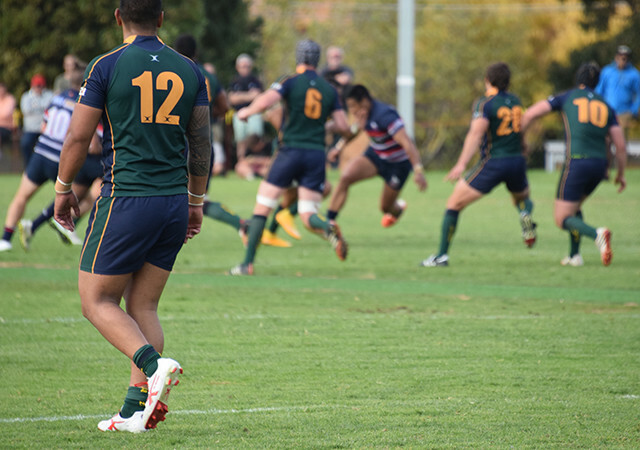 It was a fast-paced encounter in wintery conditions, as two of the competition’s strongest sides went toe to toe in front of a big and vocal crowd gathered to cheer on both camps. The opening half was a real arm wrestle as Melbourne managed to physically impact a notoriously burly Broncos line. Box Hill scrumhalf Alex Healey scored the game’s first try, splitting the game open with a devastating team breakaway. Flyhalf Michael Thompson converted the try and then made it 10-0 with a penalty moments later. The Unicorns answer came immediately through lock George Symonds, but a touch of class saw Box Hill’s Jesse Tonu touch down at the other end and re-establish the ten-point deficit at 15-5. Enter Jurrel Te Kahu. The Unicorns back rower took things into his own hands and raised the intensity of play to new heights with back-to-back tries heading into half time. Paul McConnichie converted the first try but missed the second to secure a two-point lead at 17-15 into the break. The second half began with a penalty goal apiece and a flurry of yellow cards, as the Unicorns looked to extend their lead. Melbourne managed to control possession in the green zone for as long as ten minutes midway through the half but their effort and opportunities went unrewarded as Box Hill found another gear to hold them out, before taking advantage when they got their hands on the ball. Outside centre Filipe Vilitati put the home side back in front with another penalty, before Joeli Baleilovu secured a huge try to stretch the Broncos’ advantage to 26-20. And when Vilitati was able to score a try shortly afterwards on the end of a seamless move, and Thompson converted, the score line had blown out and the game was cruelly snatched away from the visitors. And that’s how it stayed, as Box Hill’s class and composure was on full display; 33-20 the final score, with Broncos’ Number Eight Sema Hafoka adjudged the Musashi Nutrition Player of the Match. With Foostcray suffering a shock loss to Power House, Melbourne missed an opportunity to move back into a playoff spot; they remain fifth as they come head to head with the fourth place Doggies at home this week, while Box Hill host Moorabbin.